Ownership / Access: Sterckshof silver museum. 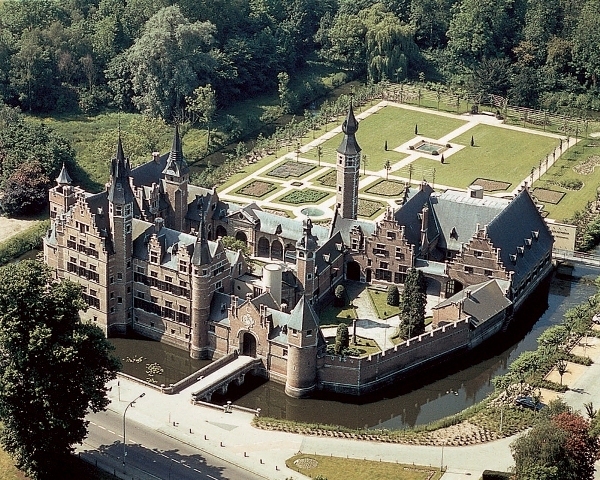 Notes: The Sterckshof castle is in Deurne, Antwerp, Belgium. It houses the Sterckshof silver museum of the Province of Antwerp. Built on the site of a much older castle, or great house, the present building is a reconstruction erected in the 1920s. In 1921 the Province of Antwerp bought the Ter Rivieren estate, with the Sterckshof castle, to make it into the current Rivierenhof park. Of the Sterckshof all that was standing was the floor of a tower, the entrance gate and some ramshackle outbuildings. In 1922 the architect JA Van der Gucht submitted plans for reconstruction. Using old pictures and archaeological discoveries, in the 1930s the building rose as an evocative reconstruction. The reconstructed building with its red brick turrets and courtyards is set in formal gardens surrounded by a moat, conveying an impression of the houses of the wealthy in the 16th century. The municipality of Deurne declined to use the building for their town hall. In 1926 the idea of using it for the province's technical department was explored but rejected since the building was not suitable. The idea of using it for a dairy was also rejected. Eventually, in 1934 an Association was founded to established a Museum of Flemish Civilization. The Sterckshof was transferred to the association on 21 May 1938 and it was immediately opened to the public. Joseph De Beer, the honorary curator, moved into the house and began acquiring what became a huge and disparate collection of archaeological, natural history, ethnology and art and crafts objects. From 1951 the state began funding the museum. When De Beer died in February 1953 the original association was liquidated and the castle was taken over by the Province of Antwerp. At first it housed the Province's Sterckshof Museum of Art Crafts, and later the Province's Sterckshof Silver Museum. As of 2012 the museum was open every day except Mondays, with free admission apart from when a special exhibition was being run. The displays covered techniques for working the metal and domestic and religious uses. It also included a silversmith's workshop. The museum includes Belgian silver and pewter wares from the 16th century until today, and also some fine antique furnishings.